What is IT Asset Disposal? IT Asset Disposal, often shortened to ITAD, is a specialized service that disposes of obsolete or unwanted IT equipment safely and in an ecologically-responsible manner. All businesses will face the need for IT asset disposal, whether it is getting rid of old and outdated computers or wiping old hard drives before replacing them with new models. 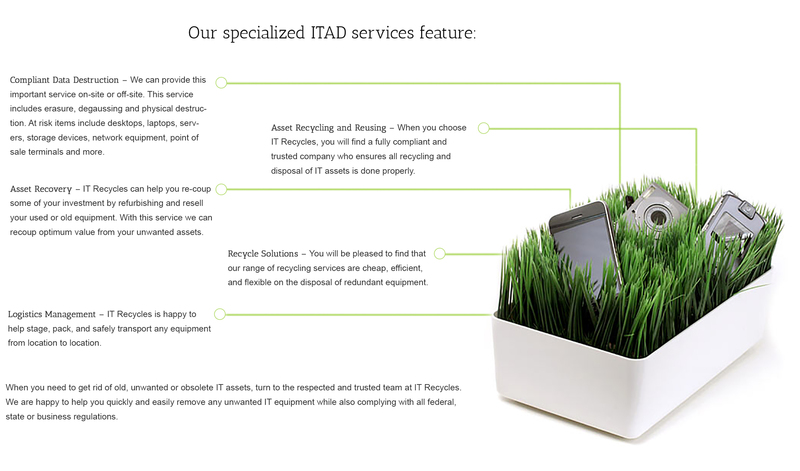 The team at IT Recycles specializes in ITAD services by streamlining the process of disposing of IT assets. This process minimizing costs to the clients as well as maximizes the recouping of investment losses. Does IT Recycles Offer IT Asset Disposal Services? Through the management of our asset retirement program, IT Recycles can make the disposal process run much more smoothly and quickly than if you attempted to remove all unwanted IT assets on your own through the many different regulators and providers. When you need a reliable company to remove assets that are ready to retirement or have become obsolete, IT Recycles is fully capable of providing you with a personalized asset retirement plan to meet your specific business needs. We can provide this important service on-site or off-site. This service includes erasure, degaussing and physical destruction. At risk items include desktops, laptops, servers, storage devices, network equipment, point of sale terminals and more. When you choose IT Recycles, you will find a fully compliant and trusted company who ensures all recycling and disposal of IT assets is done properly. IT Recycles can help you re-coup some of your investment by refurbishing and resell your used or old equipment. With this service we can recoup optimum value from your unwanted assets. You will be pleased to find that our range of recycling services are cheap, efficient, and flexible on the disposal of redundant equipment. IT Recycles is happy to help stage, pack, and safely transport any equipment from location to location. When you need to get rid of old, unwanted or obsolete IT assets, turn to the respected and trusted team at IT Recycles. We are happy to help you quickly and easily remove any unwanted IT equipment while also complying with all federal, state or business regulations. What Are the Benefits of Recycling IT Assets? ComputersTrue Data Destruction – When you get rid of an old or obsolete piece of equipment, you could face the risk of a data leak. With IT Recycles, we will ensure that all data is completely removed from unwanted equipment to protect you and your business. Help Your Community – If your equipment is still usable, consider having us refurbish it and sell or give it to the community. Though you may not need it, others in the community can greatly benefit from your unwanted IT assets. You can also recoup some of the investment you put into the equipment. Comply with Legislation – There have been several legislative acts that regulate the disposal of IT assets including the RoHS Directive, Energy Using Products Directive, Batteries Directive, WEEE Directive and a citizen’s duty of care. To ensure you are complying with all regulations (and the law), turn to the professionals at IT Recycles. Proper Disposal – We always comply with federal, state and even client business regulations or requirements to ensure sustainable recycling of all IT assets. Protect the Environment – Did you know that some IT assets can be hazardous? Some equipment contains harmful chemicals like mercury or lead that can pose a potential health risk to those who come into contact with it. To ensure you keep your community and environment safe, opt to have the professionals properly dispose of your unwanted or unneeded IT assets. Extend Your IT Asset’s Lifecycle – With our extensive refurbishing services, you can potentially reuse equipment that you thought was obsolete. This will save you a lot of money because you will not have to invest in as many new items. Recycling does not only apply to plastic bottles or glass. If you have unwanted IT items, such as computers, printers or even fax machines, you can still follow the three R’s: Reduce, Reuse and Recycle. IT Recycles is here to help make this process much easier for you. With low-cost and no-risk options, IT Recycles can ensure that your data is completely removed from unwanted machines, that usable machines are repurposed and that obsolete or broken items are properly recycled to reduce waste and comply with all regulations. If you are facing the need to dispose of IT assets, turn to the trusted team at IT Recycles for help today!